In the world we live in today, we are constantly at risk with every mouse click. At any point, someone, somewhere can hack into a company’s files, making the whole network threatened. No one wants their personal information, or a client’s getting out into the wrong hands. So what should a cybersecurity IT company be offering you? Integrity. Confidentiality. Availability. These three things are imperative to any company’s online presence. VITEC Solutions wants to help you achieve the safest networks, and work with you as your cyber security IT company. 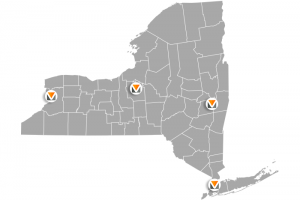 Based out of Buffalo NY, we also serve through locations in Albany NY, Syracuse NY, and New York City. VITEC Solutions offers the exact kind of security you need, when you need it. VITEC Solutions strives to give you every network security option based on your needs. Whether you are a small business just starting out, or a larger company looking for some IT work, we have the solution. Our headquarters is in Buffalo NY, with other locations in New York City, Syracuse and Albany. At VITEC Solutions, we are there to make sure that any sensitive materials stay that way. We will help protect all client information, as well as keeping confidential company files private. With the helpdesk that is available 24/7, we are always there to offer protection and support. Let VITEC Solutions worry about your network security, so you don’t have to. VITEC Solutions aims to protect you so you will never be blindsided by a cyber hack. VITEC Solutions offers maximum security for your company, so you can really focus on what’s important. Call VITEC Solutions now to set up your appointment.